Below you will find a few examples of lawn shapes that can often cause problems when measuring and deciding on the quantity you need to order. If after reading this page you are still unsure, call our office and our friendly staff can offer suggestions or talk you through any problems you encounter. Alternatively if you are able to fax, post or email drawings of your garden, we can then work out the best method for supply and installation. We would also recommend sending photos of the area as this allows us to point out any problems you may encounter during your installation or assist further with measuring information. Before ordering, also consider any access issues you might have at the installation address, for example, if access is through the house, can a 4m roll be carried through without being bent or folded? This area would require two pieces 4m x 7m and 4m x 3.4m with 4m of joint tape. We would also recommend 2 tubes of adhesive to do the join. As the drawing shows, for an area like this, it would be best to draw the shape of the garden onto graph paper, drawing it to scale, so you are then able to work out the best way to lay the grass. When you are working out your requirements, try to keep in mind the widths (2m and 4m) and decide which is the most economical way to cover the area, remembering that waste from some areas may cover small areas that extend away from the main area. You may have noticed that the white sizes are larger than the drawing measurements. This is because we would always recommend ordering slightly over your requirements to allow for minor size discrepancies and trimming for joins. If the lawn had a pond in the middle, this would be ignored when measuring the area. Only if the obstruction were a large proportion of the area would you work out each section around the obstruction. This would take extra time and use more adhesives with the risk of seeing joins, so always try to cover the area with the minimum amount of joins and when possible, put the joins on the shortest lengths. The lawn below would require two pieces 4m x 5.1m and 4m x 2.1m and 2m of join tape. We would also recommend 1 tubes of adhesive to do the join. The above diagram shows the principle way to install the grass using a 4m x 5.1m and a 4m x 2.1m (28.8sqm) and having only one join. The other method is to use a 2m x 7m roll to run along the right-hand side and then a 4m x 4m roll to cover the left section. Always ensure the grass is running in the same direction. 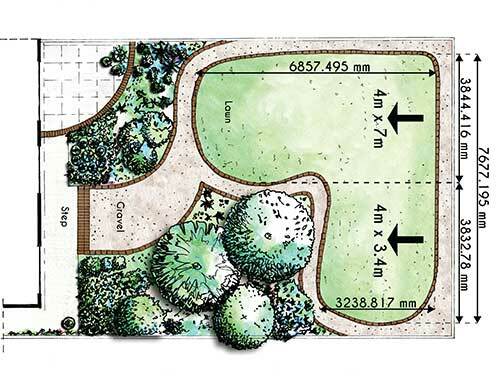 This would need a 3.9m join and use approx 2sqm extra than the other method. This demonstrates how even on a simple design, there could be a number of ways to install, so always double check that you have measured the best way for your project. We would always recommend installing as the example drawing as this ensures the pile of the grass leans towards the house. 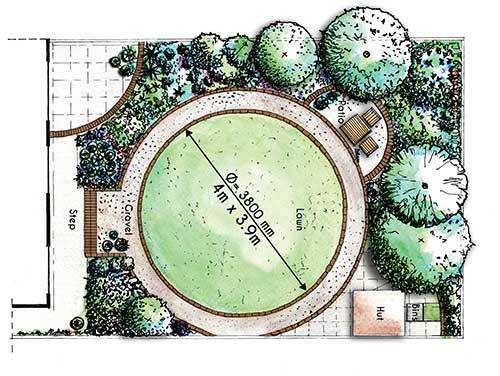 The drawing above shows a circular turf area, which could be surrounded by soil, slabs, or edging stones. To work out what you require, measure across the widest part of the circle to formulate the diameter. This example measures 3.8m across, therefore a piece 4m wide by 3.9m long would be needed, as the rolls are only available in 2m and 4m widths. We would also recommend, when you order, to add a little extra on the length to ensure it fits. If the circular area were a 6m diameter, this would require a piece 4m wide by 6m long and a piece 2m wide by 6m long, which could then be joined on-site. Note: when joining, measure the width of each roll delivered to ensure that you know how much you have extra on each roll to allow for trimming when completing the join. You would also need to order 6m of joint tape and 2 tubes of adhesive. On a 5m-diameter circle, you have two options to cover the area. Either the method above, using a 4m x 5m and 2m x 5m to make a 6m wide and you would have 5 sqm of wastage (as a 5m width is only required), however this option only requires one join. The other method is to purchase a 4m x 5m and a 2m x 2.6m. This piece would then be cut down in length and joined end to end, providing a piece 1m x 5.2m. This would then be joined to the 4m wide roll. This is the more complicated option to complete and relies on both joins being perfect. We would only recommend this on large circles where wastage can become costly. The lawn drawing above shows a lawn that is very common in city terrace houses. 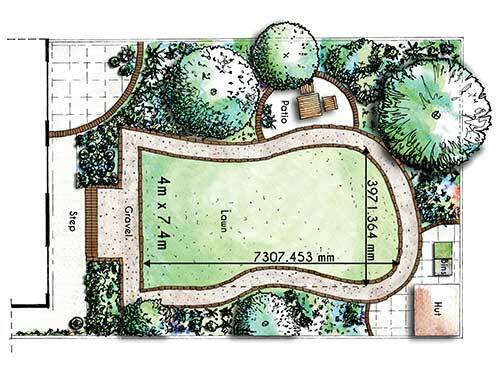 Although it has curves on both sides, all you would do is measure the width at the widest point (left to right), remembering to measure in a straight line even if the widest part is further up the garden. As this area is under 4m in width, you would simply order 4m wide x length, which in this case would be a 7.4m, allowing for a little extra. If the widest point left to right were 5.9m, you would order a 4m-wide and a 2m-wide roll by the required length of the area. Note: if the lawn was 5m wide x 7.3m long, we would recommend you use two pieces 4m wide by 5m long, which once joined would provide a piece 5m x 8m. Although the joins would be left to right rather than front to back, you would have smaller joins and more manageable pieces to position in your garden.